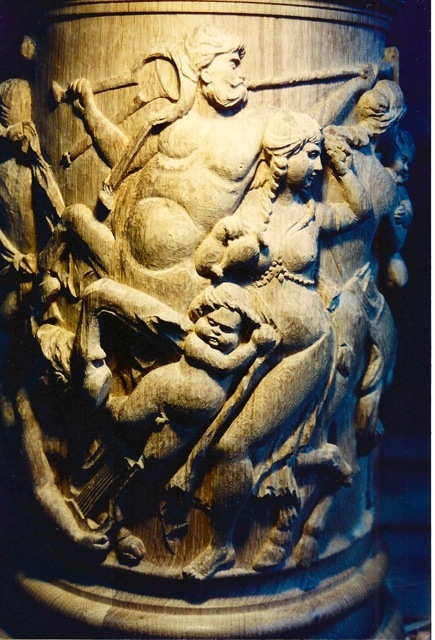 "Agrell Architectural Carving's attention to detail was astounding, from the carved capitals to the complex figure carving on the oak Botticelli column bases. Their contribution and devotion to the project was without equal." In mid-1990, faulty wiring on the Christmas tree in the Grand Hall of the Utah Governor's Mansion sparked a fire that destroyed much of the building's original woodcarving and plasterwork. The carvings were initially crafted in Europe, most likely by Austrian and German artisans at the end of the 19th century, and installed in the mansion. Agrell Architectural Carving was commissioned to replicate the carvings in the Grand Hall, which had been almost completely gutted by the fire. The project was the largest and most extensive we had undertaken to date and was also considered the largest woodcarving project undertaken anywhere in the world in the last ten years. Hand carved by Agrell Architectural Carving: A perfectly executed repica of a newell post. In fact, it took our carvers almost 20,000 hours to recreate the mansion's original woodcarvings. We also replicated the stone carvings on the columns of the upstairs south porch. The quality of the original work was extraordinary, and we knew that to achieve the same level of craftsmanship, we would have to apply a unique skill set. We used the burned pieces as a guideline, copying the construction of the original carving in every detail. The result? The newly constructed carvings are almost indistinguishable from the old. Agrell Architectural Carving - work in progress - the hand carved shell for the Grand Fireplace. Photographs taken by Scot Zimmerman of the final restoration of The Governor's Mansion. The Governor's Mansion website: Further reading about Agrell Architectural Carving's carved resoration of the mansion. 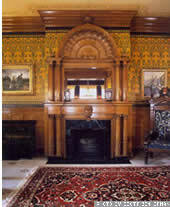 "Woodcarving and plasterwork were unique architectural features of the Utah Governor's Mansion. The original white oak carvings were of extraordinary quality." Did you know? The Governor's Mansion, Salt Lake City was designed by Utah architect Carl M. Neuhausen. Neuhausen designed a number of historic buildings in the USA including the Cathedral of the Madeleine, Salt Lake City. 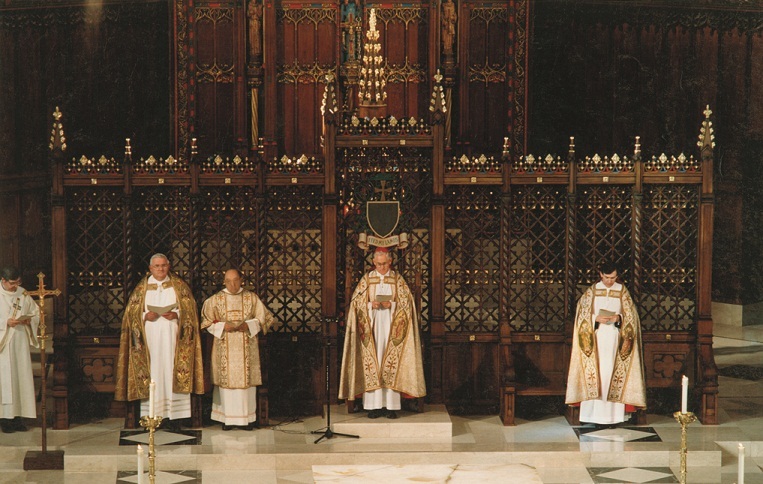 Agrell Architectural Carving provided the carved restoration of the chancel screen, the Bishop's chair, and tabernacle for the Cathedral of the Madeleine.